I read this article and found it very interesting, thought it might be something for you. The article is called Homemade Face Mask For Pigmentation and is located at https://homemademasks.net/beauty-blog/homemade-face-mask-pigmentation/. Orange could be the solution for you if your pigmentation is the result of long sun exposure. This is a very effective mask for skin pigmentation, though its success depends primarily on you applying it on a regular basis over a period of time. This will give you better results than applying it every so often when you fancy it. My advice would be to try this mask once a week for a couple of months. You should make sure that this mask does not cause an alergic reaction by reading our advice on using hair and face masks before you try it. 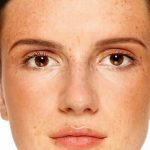 Skin pigmentation is manifested by the appearance of black or brown spots in the affected areas. The skin becomes blemished as a result of increased level of melanin. The countries in which this is a higher incidence are Africa, the Mediterranean, Asia, Arabia and Eastern Europe (places with a warm climate). Put 2 TBSP of lentils in a bit of water and let them soak from morning to evening. Dry the peel from an orange and grind it. Mix the lentils with the orange peel, add the honey and a just a bit of milk in a blender. The mixture has to form as a paste, try not to have it like a liquid. The next step is to apply the paste on your cleansed face. Wait for it to dry then gently rinse thoroughly with some warm water. This treatment should be repeated until the results are visible. By applying this mask frequently, skin pigmentation will be removed.